We are back with this week’s best of beacons post. 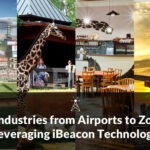 In this feature, we will cover some interesting news and updates, right from the news of the University of Texas launching a beacon-enabled app to an exciting post on how airports are leveraging iBeacon technology for better perks. So, sit back and check out the latest stories from the beacon world. The University of Texas has collaborated with a leading digital sports technology company to launch the official University of Texas beacon-enabled mobile app, available both on iOS and Android. The app aims to enhance sports fans’ experience by delivering live game audio during games. It also delivers content and information such as log-in for courses and grades to both students and campus visitors. It is fully equipped with location based alert capabilities, including geofencing and iBeacon technology. The app will be activated at Texas’ first football game on 4th of September. Check out this article to know more about the beacon mobile app by the University of Texas. A large number of sports venues and teams are now using beacons to create a frictionless and intuitive fan experience. Many Major League Baseball stadiums like AT&T Park and Citi Field have also deployed beacons to connect with their customers. Unacast’s latest Proxbook Report tracks the progress and adoption of proximity marketing at sports venues and states that 93% of Major League Baseball stadiums are now using beacons. The report also suggests that the sports teams that have deployed beacons have seen an ROI of almost 40x from incremental merchant revenues alone within the first season. Read this article to know more about what the report holds and how sports venues are leveraging proximity marketing. While restaurants, hotels, airports, sports venues, and other businesses are embracing beacons for proximity marketing, retailers have been by far the most prolific adopters. Brick-and-mortar retailers have long struggled to foster a personalized connection with their customers and now they are turning to proximity marketing with beacons to get a real-time view of the customer experience, increase engagement, and boost sales. With projections of over 1 million new beacons to be deployed in retail and trend of proximity marketing taking over, it is essential for retailers to understand proximity marketing better. Download this Retail 2016: Proximity Marketing with Beacons ebook to understand the potential of this new marketing tool and how retailers across the globe are using it to be successful. Retail stores are among the front-runners in adopting iBeacon technology. Leading retailers from Target to Macy’s to Walmart have all invested in the technology in order to deliver interactive and enhanced shopping experiences. While about one-third of the top 100 retailers have already used beacons, many retailers are still confused about how beacons should be used and what would be the correct way to deploy them. On the other hand, about two-thirds of the consumers say that beacons could improve their in-store shopping experience. Get more insights via this article that talks about how beacons are gaining popularity in the retail space. Given the hyper-local and contextual capabilities of beacons, they are of immense value to both travellers as well as players in the aviation industry. Beacons provide a gateway to ensure a smooth transition for air travellers, right from check-in and airport navigation at the port of departure to the actual travel and collection of baggage at the port of arrival. Recently, Rio de Janeiro’s Galeão International Airport deployed 3,000 beacons across its 100,000-square-meter building, in their efforts to aid Olympic visitors with navigation in and around the airport. Now, Cathay Pacific is using beacons to explore new ways of interacting with its customers. Read this article to explore how the aviation industry is leveraging beacons.